Associated Student Government community relations committee member Mike Morgan (right) brought up the idea of garage sale where off campus students could sell goods before the school year ends. About 20 students attended the garage sale on Sunday. This afternoon, Eileen Hinckle stuck yellow price tags to an exercise bike and Himalayan salt lamp, two of the items she hoped to sell at Associated Student Government’s garage sale. As students crowded around her table, she reminded them prices were negotiable. “I’m leaving in the summer, so I can’t take this stuff with me,” the Weinberg senior said. 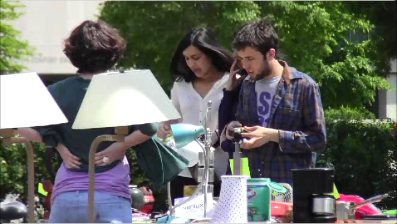 About 20 students attended the garage sale at the parking lot near Sheridan Road and Noyes Street. Students sold everything from dresses to hardware, while customers browsed and ate from two nearby food trucks. The event was the first one of its kind in at least five years, said Chris Harlow, a member of the ASG community relations committee. Northwestern Residential Services donated furniture to the event, and some students requested a rental truck to haul goods to the parking lot. ASG provided $355 for the event but saved more than $100 by sharing the truck and tables with Deering Days.